Barack Obama gave two major policy speeches about the Middle East in quick succession, May 19 and 22; and while he discussed a number of Middle East topics, the Arab-Israeli conflict portion received the lion's share of attention. Analysts and politicians who care about the Middle East's only democratic country (yes, I use that formulation now that Turkey is under AKP control) have excoriated Obama and see Israel in great jeopardy. For example, former House Speaker Newt Gingrich called the speech "a disaster" and said that Obama, in effect, asked Israel "to commit suicide." This is Obama's third gratuitous, unprovoked, and unilateral picking of a fight with Israel. The prior two took place in May 2009 and March 2010: in the one, U.S. Secretary of State Hillary Clinton declared no Israeli building even in eastern Jerusalem and in the other, Vice President Joe Biden got (mock?) outraged when such building did take place. In all three cases, the fight dwelt on a secondary issue that few had been focused on – Israeli building in the first two cases and the June 4, 1967 ceasefire lines as the basis for a permanent border agreement – until Obama turned them into headlines. Obama's picking a fight led in all cases to an immediate hardening of positions by both Israelis and Palestinians. Israelis retreated, wounded, disinclined to make concessions, while Palestinians added Obama's demands, Jerusalem and the 1967 lines, to their prior list of demands of Israel. 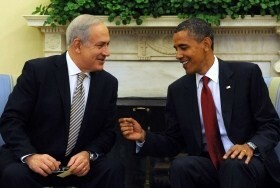 Netanyahu (left) and Obama in cheerier times, July 2010. When Obama realized his mistake – that Israeli governments make concessions more readily when relations with Washington are strong and Palestinians need to be pressured, not coddled – he crawled back to the Israeli prime minister, making nice as though nothing had happened. This has occurred twice already, in September 2009 and July 2010. The Washington Post's Dana Milbank used choice language to describe the latter episode, describing a "routed and humiliated" Obama in a White House flying "the white flag of surrender." I predict that a "routed and humiliated" Obama will regret his ill-chosen fight over the 1967 lines and, if he follows his prior schedule, should be crawling back to the prime minister in about four months' time, or September 2011. May 25, 2011 update: In what Alexander Bolton of The Hill calls "a rare rebuke of the president," droves of Senate Democrats are rejecting Obama's 1967-lines gambit. Here's a typical statement, from Senate Majority Leader Harry Reid (Democrat of Nevada): "The place where negotiating will happen must be the negotiating table — and nowhere else. Those negotiations will not happen — and their terms will not be set — through speeches, or in the streets, or in the media. No one should set premature parameters about borders." His record of grotesque, humiliating and total diplomatic failure in his dealings with Prime Minister Netanyahu has few parallels in American history. Three times he has gone up against Netanyahu; three times he has ingloriously failed. This last defeat — Netanyahu's deadly, devastating speech to Congress in which he eviscerated President Obama's foreign policy to prolonged and repeated standing ovations by members of both parties — may have been the single most stunning and effective public rebuke to an American President a foreign leader has ever delivered. he found the "sour spot": the position that angers everyone and pleases none. He moved close enough to the Israelis to infuriate the Palestinians while keeping the Israelis at too great a distance to earn their trust. … Everyone who followed the events of the last week knows that the President has lost control of the American-Israeli relationship and that he has no near-term prospects of rescuing the peace process. The Israelis, the Palestinians and the US Congress have all rejected his leadership. Obama is torn between two concepts advanced by two sets of advisers. Tom Donilon and Dennis Ross tell him to build trust with Israel and work with its prime minister. Hillary Clinton and George Mitchell argue for some public distancing to pressure Israel, woo the Arabs, and keep the Europeans on board. Obama splits the difference. Senior sources in the American Government told me that Obama and Peres agreed in a closed meeting between the two that an agreement between Israel and the Palestinians must be based on the principle of Israeli withdrawal to the '67 borders with border adjustments, or as Peres told Obama: the Palestinians must receive territory equal in size to the '67 borders. In other words, any territory that Israel demands to annex from the [West] Bank must be paid for by Israel with territory from the Negev. Along with this, the American sources emphasized, Peres told Obama that he came to him after a four hour conversation with Netanyahu. The prime minster, Peres made clear, asked to advise the American president that he opposes the '67 path, and that if Obama declares it – Netanyahu will express his emphatic opposition to the idea. (1) This is hardly the first time that Peres has taken a stance that, when adopted by American politicians leads to an uproar. Another case that comes right to mind was when Peres first used the term "occupied territories." (2) It's precisely 15 years since the Middle East Quarterly published "Shimon Says" by Roger A. Gerber and Rael Jean Isaac, a collection of what they call Peres' "characteristically idiosyncratic utterances in recent years."